Solar cells, also called photovoltaics (PV), convert sunlight directly into electricity. They are made of semiconducting materials such as Silicon. When sunlight is absorbed by these materials, the solar energy excites electrons allowing them to flow through the material to produce electricity. This process of converting light (photons) to electricity (voltage) is called the photovoltaic (PV) effect. Individual solar cells are typically combined into modules that hold about 60 cells; modules are combined in strings to make up an Array. Sunlight is collected on the Photo Array(Fig.1), usually mounted on the roof of a building. A reaction occurs between the sunlight and the array surface elements. This excites electrons on the array causing them to flow as electricity. A series of built-in electrical paths on the array surface channel the electrons into a common circuit. Wiring is fed from the Array through the DC Disconnect(Fig.2)to the Inverter(Fig.3). The inverter conditions and transforms the DC current being fed from the Array into AC power that is acceptable for use on the utility power grid. This useable power is now ready to be fed into the Main Service Panel of the building. Before it reaches the Main, it must pass through an AC Disconnect(Fig.4). This is a safety feature that enables the utility workers to turn off the feed, should they need to work on their facilities in the area that are connected to your system. 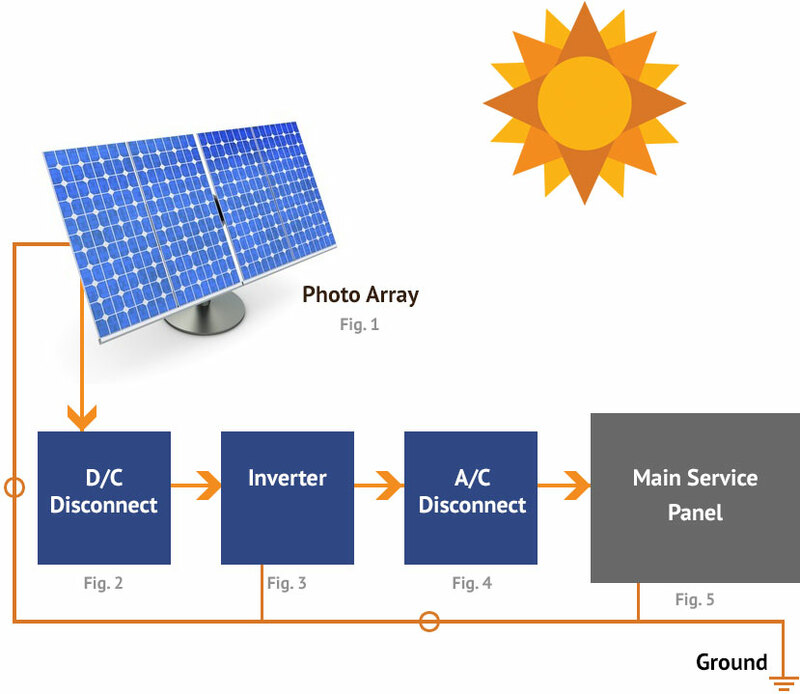 The power from your Solar Power Install is fed into your Main Service Panel(Fig.5). If you are producing more power than you are using, your excess power will be sent into the utility grid. This is when your meter is spinning backwards, and you are receiving credit for your produced power. Contact us and harness the energy of the sun!